The national language of modern-day Egypt is Egyptian Arabic, which gradually replaced Coptic as the language of daily life in the centuries after the Muslim conquest of Egypt. Coptic is still used as the liturgical language of the Coptic Church. It has a handful of fluent speakers today. Consists of inscriptions from the late Predynastic and Early Dynastic period. The earliest known evidence of Egyptian hieroglyphic writing appears on Naqada II pottery vessels. The language of the Old Kingdom and First Intermediate Period. The Pyramid Texts are the largest body of literature written in this phase of the language. Tomb walls of elite Egyptians from this period also bear autobiographical writings representing Old Egyptian. One of its distinguishing characteristics is the tripling of ideograms, phonograms, and determinatives to indicate the plural. Overall, it does not differ significantly from the next stage. Often dubbed Classical Egyptian, this stage is known from a variety of textual evidence in hieroglyphic and hieratic scripts dated from about the Middle Kingdom. It includes funerary texts inscribed on sarcophagi such as the Coffin Texts; wisdom texts instructing people on how to lead a life that exemplified the ancient Egyptian philosophical worldview (see the Ipuwer papyrus). Tales detailing the adventures of a certain individual, for example, the Story of Sinhue; medical and scientific texts such as the Edwin Smith Papyrus and the Ebers papyrus; and poetic texts praising a god or a pharaoh, like a Hymn to the Nile. The Egyptian vernacular already began to change the written language as evidenced by some the Middle Kingdom hieratic texts, but classical Middle Egyptian continued to be written in formal contexts well into the Late Dynastic period (sometimes referred to as Late Middle Egyptian). Records of this stage appear in the second part of the New Kingdom, considered by many as the “Golden Age” of ancient Egyptian civilization. It contains a rich body of religious and secular literature, comprising such famous examples as the Story of Wenamun and the Instructions of Ani. It was also the language of Ramesside administration. Late Egyptian is not totally distinct from Middle Egyptian, as many “classicisms” appear in historical and literary documents of this phase. However, the difference between Middle and Late Egyptian is greater than that between Middle and Old Egyptian. It’s also a better representative than Middle Egyptian of the spoken language in the New Kingdom and beyond. 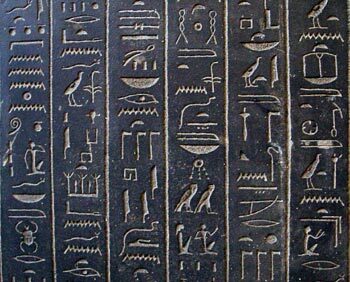 Hieroglyphic orthography saw an enormous expansion of its graphemic inventory between the Late Dynastic and Ptolemaic periods.